Shane Lee Capture The " 1st Annual Fall Classic"
10-27-12 - The First Annual Fall Classic at Hickory Motor Speedway on Saturday night proved to be an exciting night for both the fans and the drivers. It was a brisk evening as the children enjoyed an inflatable obstacle course, slides, bouncy houses, free candy, and other great fall activities. Although the weather was cool, the action on the track was hot. The Red Baron Renegades would lead off the show with fast timer Carroll McKinney in the #16 leading the field to the green flag. However, the #75 of Charlie Neill would lead the first lap. The caution flew on lap 3 when the #4 of Joseph Hodges made contact with the #14 of Eddie Russ. Action would continue with a three car pileup involving the #16 of McKinney, the #4 of Hodges, and the #6 of Tim Childers that would bring out the caution for the second time. Neill would continue to lead and take the checkered flag followed by the #64 of Darby Crouch and the #16 of Carroll McKinney rounding out the top three. The Super Trucks would roll off as the second event of the night with the #16 of Clint Fields leading them to the green flag for their 50 lap feature. Side by side racing would be the norm three deep through the field as Fields battled the #09 of Trevor Hignutt for the lead. Hignutt would eventually take the lead followed by Fields, with the #02 of Jason Cochran in third and the #33 of Jeremy Birch battling with the #25 of Mark Johnson for fourth. Birch would eventually take the spot. The first caution of the night would fly with contact between the #03 of Chase Campbell and the #29 of Rickie Dennie. A heated battle would ensue between the top eight trucks until the end, but at the line it would be Hignutt followed by Birch, Johnson, Cochran, and Fields rounding out the top 5. The #21 of Roger Pitts would bring the Paramount Kia Limited Late Models to the green flag as Pitts would take the early lead followed by the #10 of Ryan Vasconcellos, the #75 of Landon Huffman, the #55 of Zach Bruenger, and the #9 of Charlie Watson would round out the top five in the early stages of the race. The top three settled in single file while the rest of the field battled for fourth. The drivers showed a tremendous amount of patience, as they would have 100 laps to settle it. As the early stages of the race progressed, Vasconcellos would take the lead from Pitts on lap 27 with Huffman in pursuit. The first caution would fly when contact occurred between the #77 of Mark Goin and Vasconcellos, which allowed Huffman to inherit the lead. The race would restart on lap 61, and it was clear that the tempo of the race was beginning to pick up. Huffman restarted with the lead while Pitts and the #00 Shane Lee restarted second and third, respectively. Lee, the 2012 Paramount Kia Limited Late Model Track Champion had assumed 3 rd , but was being challenged by Bruenger and the #75 of Bill Lett, who had moved to fifth. With only twelve laps remaining, contact between Pitts and Bruenger would bring out the caution and send both cars to the pit area. On the final restart, Lee and Huffman would battle side by side with Lee assuming the lead and taking the win followed by Huffman, the #69 of Nick Waycaster, the #70 of Gary Ledbetter, and the #75 of Bill Lett rounding out the top five. 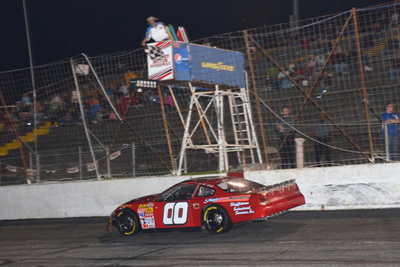 Hickory Motor Speedway will be open for testing throughout the off season. Hickory Motor Speedway will honor their champions on December 8th at the Newton Expo. You can contact the speedway office for further details. Hickory Motor Speedway would also like to thank the sponsors, competitors, fans, workers, and everyone that makes this race track the legendary facility that it has become. Hickory Motor Speedway will start the 2013 race season in March, and we look forward to seeing you next year at “America's Most Famous Short Track”.